Gyorgy Szimuly, a Hungarian ornithologist with 35 years of birding and conservation experience, initiated the day as an international celebration and focus on shorebirds. An annual shorebird count of Bay Area shorebirds already occurs and Point Reyes Bird Observatory/Point Blue has been keeping local data on Bay Area shorebirds since the 1970s. (You can find the results on their website.) According to the 2011 "State of the Birds of San Francisco Bay" report, our local shorebirds are doing well, for the most part, with the majority at stable population numbers. Enjoy this lively YouTube video, "Dance of the Shorebirds", from the Nature Conservancy. While this video features birds in the state of Washington, you can watch this same dance along our shorelines where shorebirds congregate. Worldwide, however, many shorebird species are in peril mostly due to habitat loss as well as human disturbance, including hunting. 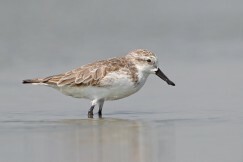 In fact, the spoonbill sandpiper, the celebration’s “Shorebird of the Year” by popular vote, is perilously close to becoming extinct in the next five years with less than 100 pairs remaining in the wild. 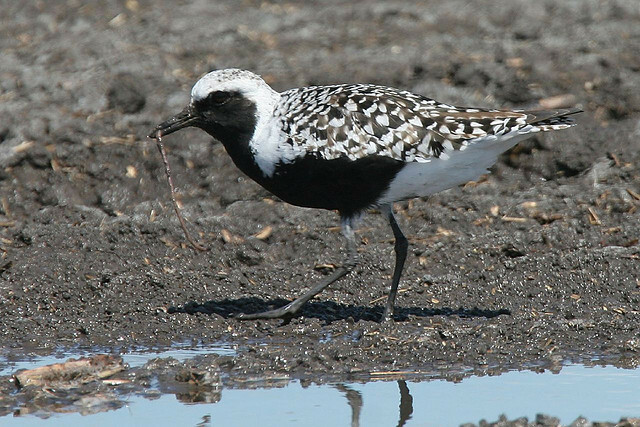 You can find out about efforts to save this unique species at the "Saving the Spoonbill Sandpiper" website. You won’t find this bird with the unusual bill along our shores, though, as their migration path takes them on the Central Asian Flyway. The funds raised through this years celebration will go toward saving the spoonbill sandpiper. Voting is already open for next year's "Shorebird of the Year" if you’d like to weigh in on their website. Conserving an international migrant like shorebirds is a difficult undertaking as they travel through so many geopolitical boundaries, oftentimes congregating in large numbers at key feeding and resting sites. San Francisco Bay and the Copper River Delta, further north, are two vital sites where even small local habitat changes from development or oil spills can have disastrous consequences for migrating shorebird populations. Groups like the Western Hemispheric Shorebird Reserve Network (WHSRN) seek to establish international agreements about preserving areas for shorebirds. They suggest that raising “awareness among the decision makers, residents and visitors in your local community about the importance of your site to shorebirds’ survival, about their role as stewards and about the human and economic benefits of maintaining healthy habitats,” is an important step in ensuring shorebirds continue to inhabit our winter shorelines. WHSRN has listed San Francisco Bay as a site of "Hemispheric Importance" -- their highest designation -- to migrating shorebirds. Our bay is the largest estuary on the Pacific Flyway -- the highway in the sky that shorebirds follow each season on their annual migration -- and a vital overwintering site as well as resting and refueling stop for the birds that continue further south or north.